Season both side of pork chops with salt, pepper and smoked rub spice blend. 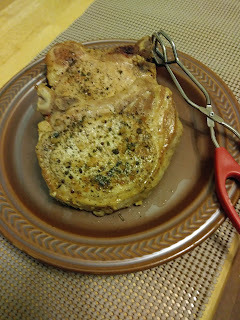 In large skillet, brown pork chops in olive oil. Remove from skillet, and set aside. Pour chicken broth into skillet, add worcestershire sauce, minced garlic and onion powder. Place pork chops back into skillet. Bring to boil, reduce heat. Simmer 5 to 8 minutes, until pork chops are cooked.